Create manual tests in ALM Octane. Tests can be created from the Quality and Team Backlog modules, either from the Tests page or from a Test Suite. You can compose a test script using either the Text Editor or the Visual Editor. Typically, tests are created using the Text Editor, however, you can also use the Visual Editor. The Visual Editor includes all of the functionality provided by the Text Editor, except for text formatting. From Team Backlog or Quality modules, click Tests, click the down arrow next to the + icon, and click Manual Test . From a Test Suite, click Tests, click the down arrow next to the Add Existing Test button, and then click Manual Test. Test type The type of test, such as acceptance, end-to-end, regression, sanity, security, and performance. Estimated duration (minutes) The time it takes to run the test. Backlog coverage The backlog items the test will cover. This helps you track the release quality. Click Steps, and then click Text Editor . Note: To use the Visual Editor, to add or edit steps, click the Visual Editor button. Use the buttons in the toolbar to add steps. If you are entering the entire test manually, make sure to use the correct syntax. For details, see Manual test syntax. Add a setup step (an action in the application). Enter the step text. For example: Create a new Epic. Check something in the application. Enter the step text. For example: Verify that the current phase is New. During the test run, you specify a pass or fail status for each validation step. Add steps from an existing test to your script. In the Add Tests dialog box, select the test or test that you want to call, and then click Add. The step is added as a hyperlink to the original test. Click the View test steps button to display the steps of the test that you called. To apply text formatting, see Format text in the test script. To add attachments, select a step and click Attach to add files and navigate to the required file or paste an image directly into the test. Note: When working with Internet Explorer, use the Attach button and not the copy/paste option. In the text editor, ALM Octane seems to add the attachment as a separate step in the test. If you check the visual editor, you will see the attachment is actually associated with the selected step. You can view the file in the Attachments tab of the test, the Manual Runner when starting a test run, or the test run report. You can use parameters in tests in order to run a single test several times with different values. To use parameters you must create a data table, define the parameters, and create at least one data set with values. The number of rows in your data set determines the number of iterations the test will run. If you create multiple data sets, when you run the test, you will be able to select the data set with which to run the test. If you want your test to reflect numerous scenarios. For example, if you want to test log in success and log in failure, you can create a data set for each. One with credentials that are meant to work and another with credential meant to fail. Another example is creating a data set for each environment you want to test, like different browsers or different operating systems. Data tables are shared, so you can use a single data table for multiple tests. In the Steps tab of the test, click Data Table. In the pane that opens on the right, click Create a new table. Enter a name for the table and rename the parameters. , and add or remove columns as required. To add or remove rows or columns, click the dropdown arrow next to the row or column name. The arrow is visible when you hover over a cell or column header. Parameter names cannot contain empty spaces or angle brackets (< >). In each row, enter a set of parameter values. To add data sets, click the menu and then click Add Set. Enter parameter values for this set. Note: The first data set that you create is the default data set. When a data set is not explicitly selected, the default data set is used. Click Save when your table is ready. You can use the menu options next to the Save button to manage your parameter tables. If you select Remove from test, you disconnect the table from the current test but it is still saved in ALM Octane. If you select Delete table, it is removed from all tests that are using this parameter table. 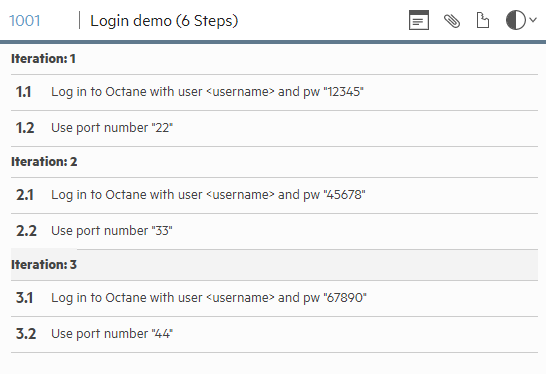 ALM Octane shows you which tests use the table before you delete it. In the relevant test step, enter parameter names using the following syntax: <parameter name>. Tip: You can also quickly access the list of parameters by pressing CTRL-SPACE. 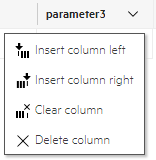 Use the keyboard arrows to navigate the list, and Enter to select a parameter. When you run the test, it runs in multiple iterations. Each iteration uses a different set of parameter values from the table.